Earlier this month, I spent a night in Corona, CA. 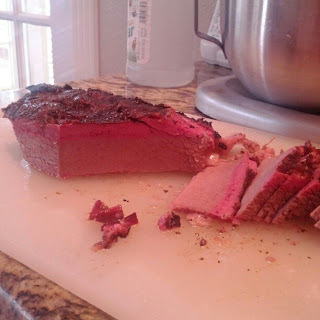 I'd never eaten tri-tip, so I figured it was the time and place. Drove my rental car to Wood Ranch BBQ, a SoCal chain of 14 "premium-casual" restaurants. Ordered a 2-meat plate with tri-tip, half chicken, broccoli, and rice. It was interesting eating steak with BBQ sauce on it. It was by no means covered/drenched in sauce; just a layer. A good amount. I thought it was cooked a tad too much, but maybe tri-tip isn't supposed to be pink. Someone enlighten me. Like I said, this was unchartered territory for me. I eat my steaks medium rare, but I can't remember if I ordered it MR or medium. It was whatever the waiter recommended. The chicken was rotisserie style. 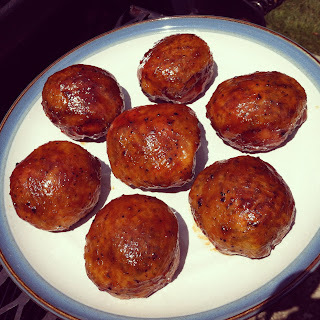 Excellent flavor/seasoning, but the breast was too dry. So was the rice; kinda hard in some places. The chicken stock that was on the plate was welcome for both. Nice, al dente broccoli. Hot bread that I asked them to take away, so that I wouldn't eat it all. Large glasses of iced tea, and they brought a fresh one every time, instead of just refilling the one I had to the point that I ended up, as always, with a glass full of ice. It is rare for a place to bring a fresh tea every time. MAJOR props for this. Plus, their branded to-go cups were huge. Another round of props. The bar, which wasn't very busy, so I had a good bit of time to chat with the two bartenders. Service was excellent. After dinner, I walked over to TAPS Fish House & Brewery for some iced tea and a cigar by the fire pit on their lakeside patio. A good night in Corona. 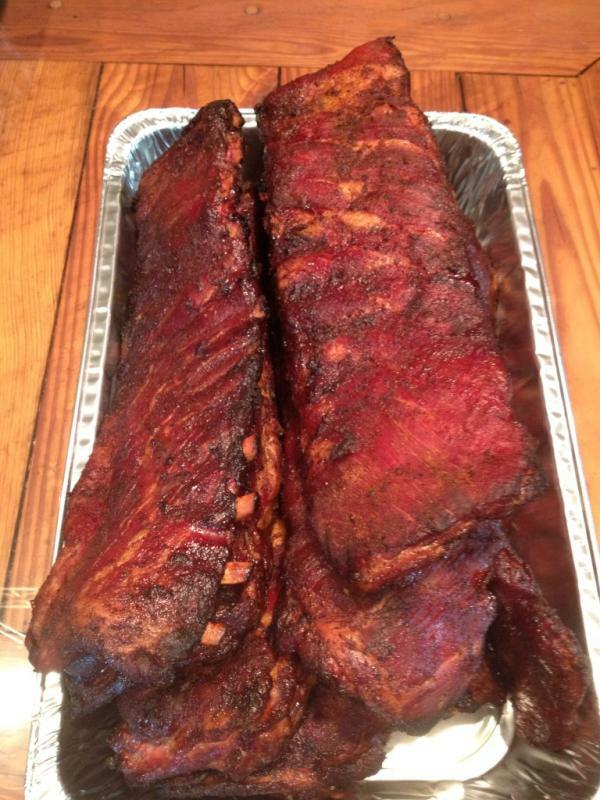 Joseph's Riverport Barbecue rises from the ashes! Schmidt Family Barbecue headed for Austin! The family behind Smitty's Market and Kreuz Market, two popular BBQ joints in Lockhart, TX, are teaming up to open a Lockhart-style joint here in Austin: Schmidt Family Barbecue (Follow them on Twitter.). My friend Addie Broyles has the inside scoop. Thanks to our great sponsors, we had some tasty drinks & treats for our June 16 BBQ bus trip: ice-cold Big Red and Honest Tea, hot coffee from Fara Cafe, & delicious cupcakes from Sugar Mama's Bakeshop! And many thanks to Conjunctured for giving us a great place of departure! Started with 64 cities, and now it's down to 2: Lockhart (TX) and Austin (TX). 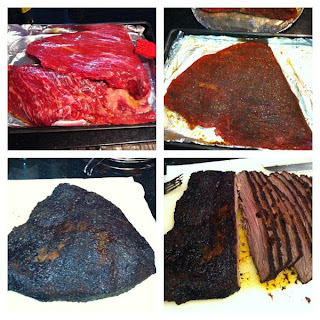 Each smoked its competition in the Final 4 (results). 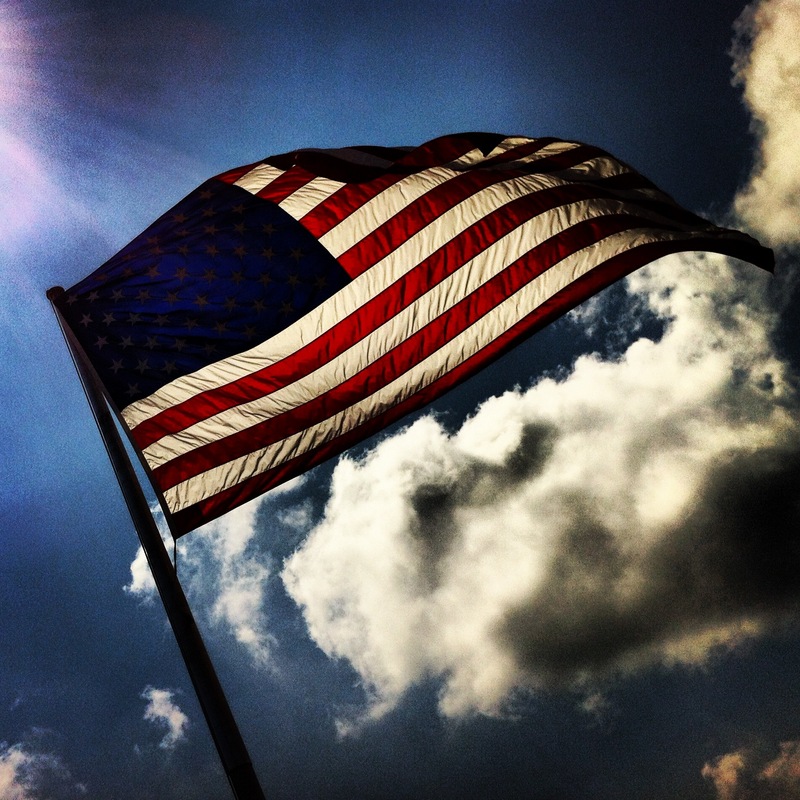 Not much left to say, other than you have 14 days (including today) to VOTE. This should be interesting. Stopped into Brothers BBQ earlier this month, while I was in Denver. I had just eaten lunch, so I just ordered a quarter pound of pulled pork and potato salad. When it arrived at the table, I noticed that part of a straw wrapper was buried in the pile of pork. Surprisingly, I let them bring me more of the same. Thank goodness for sauce, b/c the pork was bone dry. Potato salad was great. Very friendly service. 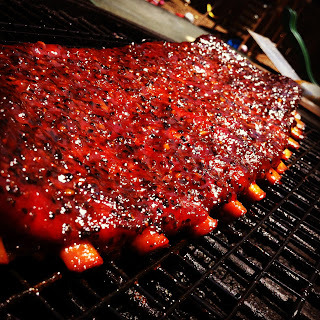 Our 14th Backyard BBQ submission comes from The Windy City. 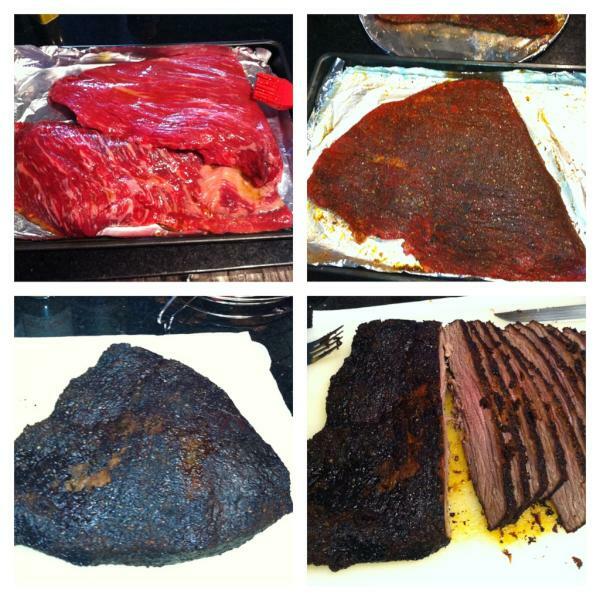 Chicago's Jim Cavanaugh (@JPC671) sent me these chronological pics of a brisket he cooked up. Not too shabby for the Upper Midwest! 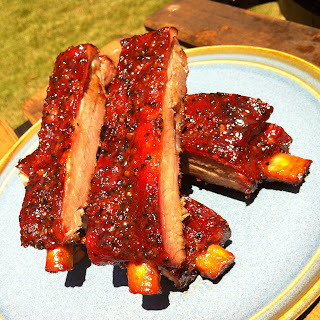 Woodpile BBQ is coming to Austin! Austin is about to get yet another BBQ joint. Woodpile BBQ, a new project for Driftwood-native Levi Smith, will serve from a trailer on the Westbound side of Hwy 290, not too far past the Y in Oak Hill. As for what Woodpile BBQ is about: "Woodpile BBQ is owned by Levi and Rachel Smith, parents of two beautiful girls and longtime residents of the Austin, TX area. 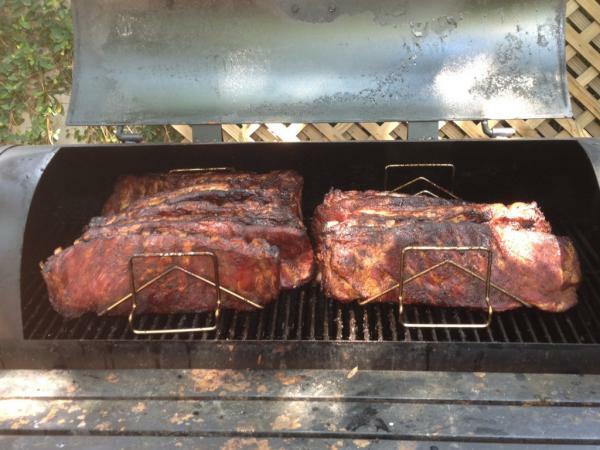 Levi manages the company and serves as pitmaster. Their vision for Woodpile BBQ goes beyond the initial Saturday lunchtime only service. If enthusiasm is strong, Levi and Rachel plan to open for lunch on weekdays too and make Woodpile BBQ brisket and ribs available in local grocery stores and through local delivery services and national mail order. 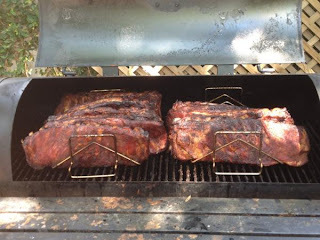 Levi and Rachel want to make getting exceptional, all natural barbecue convenient without compromising simple and traditional techniques." Check out their menu, & find them on Facebook & Twitter. Good luck, Levi! In Denver a couple of weeks ago, I stopped in for lunch at Russell's Smokehouse, a down-the-stairs, feels-like-a-speakeasy spot on Larimer Street in LoDo. Had the chopped-brisket sandwich, served on a potato bun. They definitely don't skimp on the serving size. A big plate for $8 (lunch menu). Lots of meat. Not the most flavorful (not surprising it didn't deliver on smoke, considering they cook indoors with electric; "Smokehouse" might not be the most accurate name), but the vinegar-based sauce helped out. Good pickles. Had the field greens (with smoked-tomato vinaigrette) as my side. Enjoyed it. Good service. Back by popular demand, local firefighters will participate in the ultimate barbeque throwdown in hopes of claiming the title for best barbeque recipe. The Second Annual Firefighter Q Off is scheduled for Sunday, June 24 from 2 p.m. to 5:30 p.m. at Q on the Riverwalk, located inside the Hyatt Regency Hotel. In addition to tasting some of the finest barbeque rustled up by San Antonio Fire Department firefighters, guests have the opportunity to learn about fire prevention and grilling safety. Deborah Foster, public information officer with the San Antonio Fire Department, says many grilling accidents could be easily avoided by following simple precautions. August 25 Bus Trip: BBQ, Wine, & Coffee! I've mapped and timed it and expect the trip to last 9 hours. But to be safe, let's call it 10. Sooooo, don't buy a ticket if you're not cool with a 10-hour trip! This weekend's 12-hour trip flew by, so 10's gonna be a breeze. Not literally, of course, as the trip is August 25. It is gonna be HOT, people. So, if you buy a ticket and complain about the heat, don't blame it on me. I didn't cause it! For those of you who don't mind spending the better part of a steaming-hot day with smoked meat, cold drinks, and people who don't mind spending the better part of a steaming-hot day with smoked meat, cold drinks, and people who...you get it...then read on. Your ticket includes everything listed above. There is no need for you to spend any money on the trip, unless you decide to make additional purchases at any of the stops. You pay us, and we take care of everything else. You hop on the bus, relax with your drink of choice, and we cart you around. We'll, of course, include some other goodies in your ticket. Tickets are $150 each. Must be 21 or older to purchase. No refunds. As always when I'm back home, stopped into Green Top for dinner. Two outside-chopped (pork, obviously) sandwiches for me. Chopped plate for my brother. And as always, stupid good. Our 13th Backyard BBQ submission comes from C.P. 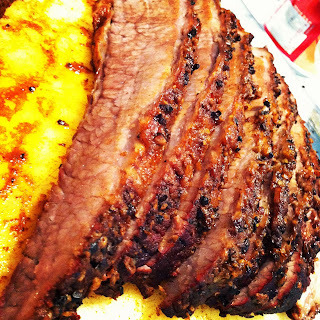 Swindler (@stratoblaster2), of Wimberley, Texas: brisket. These awesome pics are our 12th Backyard BBQ submission, courtesy of Steven Hartsock (Atlanta, GA), the man behind Socks' Love Rub Co.